Will Ferrell is reprising one of his most beloved roles, and will be returning as Anchorman's Ron Burgundy for a new podcast next year. 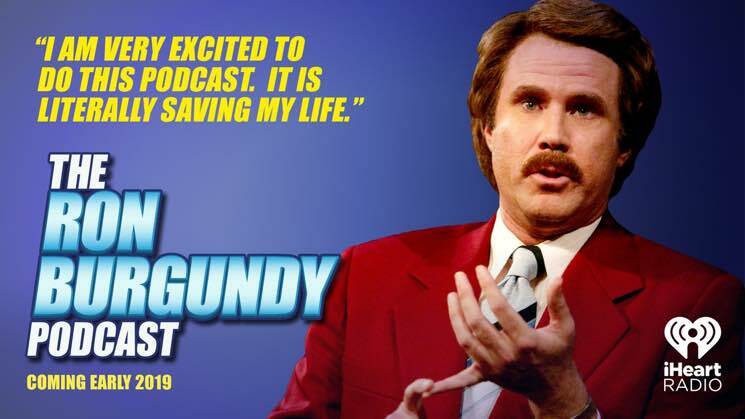 The red suit-wearing, moustachioed man will host The Ron Burgundy Podcast, a production of Funny or Die that will air on iHeartRadio. The audio series has been picked up for two 12-episode seasons, and the first one will debut in the first quarter of 2019. The second season is expected to follow mid-year. "Listen, I don't know what a podcast is, but I currently have a lot of time on my hands and a lot to talk about," Burgundy said in a press statement. "I am also broke. Therefore, I am very excited to do this podcast. It is literally saving my life." He's also started promoting the podcast on a new Twitter feed — or at least trying to clear his name ahead of the podcast's debut. Burgundy reached out to Don Lemon to sort out his White House press credentials, but it didn't go so well. See the exchange below. They said I ate 12 dogs! I only ate 4 dogs!!! I'm not Kobayashi for cripes sake! Anyway, old friend, was wondering if you could do me a favor. Mr. Burgundy, I gotta be honest I don't remember ever meeting you and frankly I'm a little shocked you have White House press credentials. I know I stand for a free press and all but just not so sure you should have those credentials. Don, I am laughing out loud! So about that favor: the media landscape is changing so fast and I DO NOT CARE FOR IT. That's why I'm starting a "podcast!" Have you heard of "podcasts?" They're hotter than Jane Fonda's workout tape! Anywho, I need help getting the word out about mine. What do you say best friend? Please do not start a podcast and stop contacting me. Okay, so no podcast plug. Got it. By the way just so you know, our friendship is over. YOU GO STRAIGHT TO HELL. DO NOT DISRESPECT ME IN A PUBLIC FORUM. DON IS A GRADE A JERK. BURGUNDY, OUT. I'm starting to think Don ate the hot dogs. Not how I wanted to do this, but I am formally announcing I am doing a podcast!